In case you missed it, STAMPtember is in full swing and today there is yet another fabulous collaboration, with one of my favorite stamp companies I might add, Hero Arts. Last year they did a fantastic Prayers Stamp & Cut set and this year there’s similar Happy Thanksgiving set. I started working on this card by die cutting a beautiful wreath out of glitter paper. I wanted to have something to frame my message and this wreath worked out perfectly. 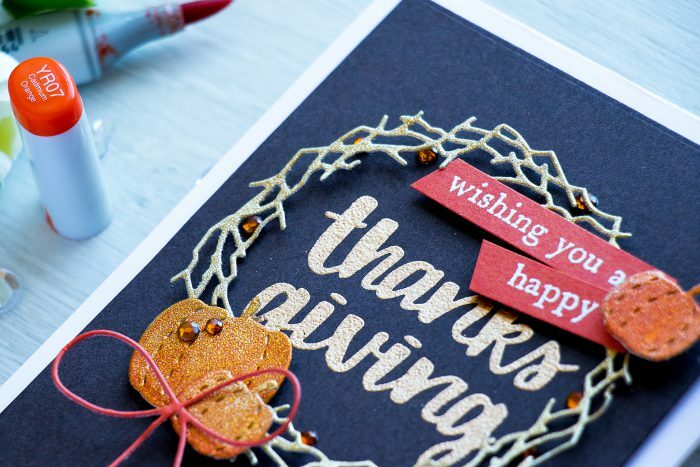 My sentiment, thanksgiving, was heat embossed in Simon’s Antique Gold embossing powder onto a brown cardstock pane. 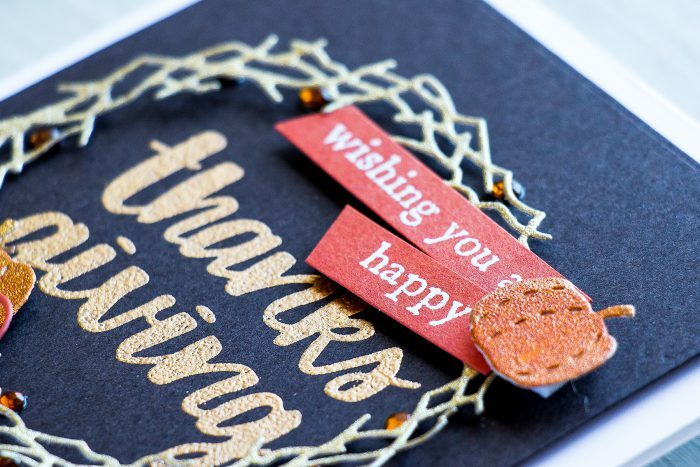 I also embossed Wishing You a Happy sentiment in white embossing powder on Burnt Orange cardstock. I knew I wanted to add a few pumpkins to my card, so I die cut several out of same gold glitter paper. I wanted to use orange glitter paper, but I didn’t have any so I used my Copic markers instead and added some orange shading. You can use any other alcohol markers or even alcohol inks. I wanted to pop my die cut wreath up, but since it is such a delicate die cut I couldn’t add foam adhesive, so I hid it behind the sentiment strips and pumpkins. To finish this card I foam mounted this brown panel onto an A2 top folding card base and added several brown gems from Hero Arts. I wish I got to work faster to make an order and get those before they disappear. What a great collaboration! And your card is stunning! !